Lovers of Mediterranean salads take heed: that drizzle of olive oil could get a bit more expensive. A dismal olive crop in Greece and underwhelming harvests across the southern European olive belt largely due to dry weather have lifted prices. 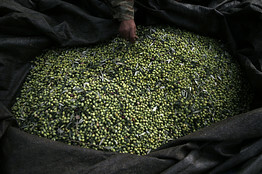 The U.S. Department of Agriculture expects the 2013-14 olive harvest in Greece to slump by 57% to 155,000 tons. Dry, hot winds blowing over from North Africa resulted in a drought that analysts say ravaged a large part of the harvest in the world’s third-largest olive oil producer. The International Olive Council, an industry body, said the harvests in the two biggest producers–Spain and Italy–are expected to be below initial expectations, and yields in secondary producers Turkey and Tunisia are forecast to be down 33% and 60%, respectively. Supplies from Greece are usually relied upon to make up any shortfall in the overall market. Greek olive oil, renowned for its floral fragrances, is used in some Spanish and Italian blends. Vito Martielli, senior oilseeds analyst at Rabobank, said the Greek harvest shortfall is supporting olive-oil futures prices that are traded on the Mercado de Futuros del Aceite de Oliva in Jaen, Spain. Virgin-olive-oil futures for July delivery are at their highest level since April 3 at €1,655 a metric ton. In February 2013, olive oil futures soared to €2,850 a metric ton when drought slashed top producer Spain’s crop by 40%. “In all probability these levels tie in with the lower level of Greek production for 2013-14,” the International Olive Council said. Wholesale prices are also on the rise. According to data from the International Olive Council, Greek ex-mill olive oil prices have risen 16% since December, to around €2.80-€2.85 a kilogram, while in Italy a kilogram costs €3.40—that is 6% higher than at the turn of the year. Final crop numbers from Italy and Spain are due in the next few weeks. According to the Association of Cretan Olive Municipalities, losses to farmers this crop year will likely be in the region of €200 million. Olive oil production in Greece is concentrated in the Crete and Peloponnese regions and the harvest cycle typically runs from October-January. Around 90% of Greek olive oil is shipped to the European Union, with around 80% in bulk form and 10% in Greek brands.